They come in all shapes and sizes. They may be funny or serious. They celebrate special occasions and special feelings. They are done with creativity and intricate detail. They are awesome works of art…the cookies made by my daughter-in-law. Cookies cutters are essential to her craft and provide the basic foundation for making multiple cookies of the same exact design. 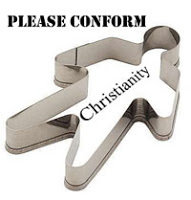 While producing multiple cookies of the same exact design may be desirable when baking cookies, God never intended for all Christians to be the same…God doesn’t make cookie – cutter Christians! If God had wanted us to all look and act alike, he would have given us a set of hard and fast rules. We’d have a dress code and be programmed like robots to look and talk like we all came from the same mold. How boring and dull that would be…and how ineffective. There are a lot of competing voices telling us what the “Christian woman” should be or look like. Words like “graceful” and “modest” and “prim” and “proper” seem to make up most of those definitions…but sometimes those words don’t fit us. Sometimes we prefer sweatpants to skinny jeans. Sometimes we are the guitar player and not the choir girl. Sometimes we are the woman without a Facebook or Pinterest account. And all that is OK because the reality is, God uses all kinds of women for His purpose – Mary the teenager who was supposed to marry a carpenter, Rahab the prostitute who sheltered the spies, and a Jewish girl named Esther who saved her people. God has gifted each of us differently and we are to use our gifts to glorify God and serve others. Aren’t you glad that God loves variety? Our God is a hands-on God…very individual oriented. Before we were even born, He fashioned us. (Psalm 139:13-16) He gave us strengths and weaknesses, dreams and desires and skills that would ensure our ability to accomplish and achieve our unique purpose. He invested time and effort and took special care to blend our physical, emotional and spiritual selves so that we are one of a kind. We are a work of art that is not replicated…His work of art. Because we are God’s unique creations He needs us to tell our stories – stories that can’t be explained apart from God’s grace…stories that someone else who is struggling as we have needs to hear. Our role as a Christian woman is not supposed to look like the one of the woman next to us. We may feel that we are not smart enough, faithful enough or virtuous enough to tell our stories, but God has and will continue to use women who are imperfect…that means you and me. The world will not be changed because we have perfect hair or the most fashionable clothes. It will be changed as people see the reality of the gospel lived out in our lives. It’s OK not to fit the cookie – cutter mold. It’s OK not to be graceful or poised. It’s OK to be scared. It is OK to be the woman God created you to be. It’s OK to be you. Truth to Claim: Each of us is a work of art created by God for a unique purpose. Application: Be prepared and willing to share your story of God’s grace when an opportunity presents itself.